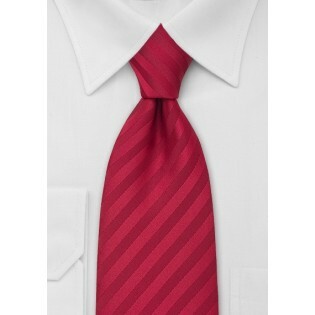 You could wear this bright Persian red tie with a variety of shirts and suits. Put yourself in a crisp, white shirt and black suit, and have a timeless power suit at your convenience. This versatile tie has evenly spaced stripes, so it is safe to wear with shirts that have contrasting stripes, and or check patterns. The colors in this tie are bold, so match it to your favorite classic suit, you’ll be calling attention to yourself. There is no reason not to have a fresh wardrobe of distinctive ties all year round, so have a variety of red ties there. A dark suit, like navy or black, picks up the burgundy red stripe in the tie, and the Persian red stripe works the same for a lighter gray suit. 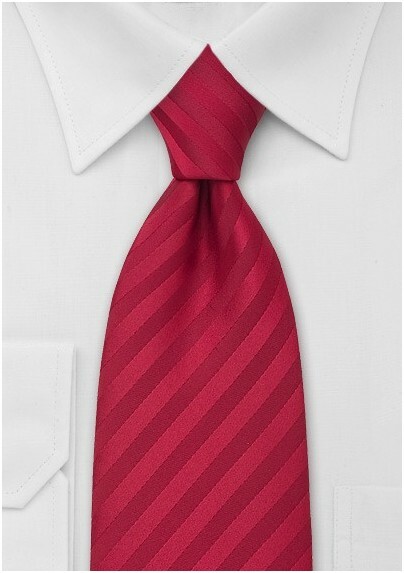 This tie is made of a microfiber that has the look and feel of silk. This fabric is strong and resistant to stains.